The use of thermography has revolutionized predictive maintenance inspection programs for virtually all types of industries. A thermal imaging camera is a reliable non contact instrument which is able to scan and visualize the temperature distribution of entire surfaces of machinery and electrical equipment quickly and accurately. Thermography programs have contributed to substantial cost savings for our customers around the world. The cameras are ideal for predictive maintenance and planned inspection of electrical and mechanical systems to ensure they operate at maximum efficiency and safety with minimal energy consumption. The FLIR T-Series of portable thermal imaging cameras takes ergonomics, weight and ease-of-use to a new level. Usability is key: our engineers have translated user feedback on comfort and clarity into a series of comprehensive and innovative features. 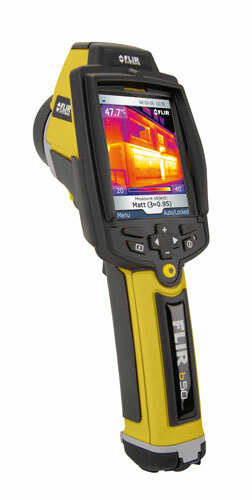 Furthermore, the FLIR T-Series has been specifically developed for industrial environments. The FLIR T640 / T620 combine the ergonomics and flexibility of the FLIR T-Series with the extremely high image quality of the P-Series. The FLIR T640 / FLIR T620 offer a crisp thermal image of 640 x 480 pixels on which the smallest of details can be seen. An intuitive user interface supported by state-of-the-art touch-screen technology make the FLIR T640 / FLIR T620 extremely easy to use.